In our reviews so far we've covered a lot of ground when it comes to fish finders. But, there's nothing like the Venterior Portable as far as prices go. When it comes to affordable devices, this unit is the absolute champion. That's why we just had to take a closer look at it and if it was worth the money. We've talked about basic products before, but this one takes that to a new level. It's a bare-bones device with one sensor beam angle and a small LCD screen that has a somewhat modest resolution. Despite all of this, we think it can be a good option if you can't afford a brand name unit or want to try out a cheap fish finder. So let's take a look at what's hidding inside of this device. Setup of the Venterior is quick and straightforward. All you have to do is install four AAA batteries. For better battery life and reliable operation, we recommend you buy quality products. We tested this fish finder with rechargeable batteries and didn't have any problems. The Venterior can work for hours and hours. Included in the package of this wired unit are a simple looking rubber float and 25 feet of cable. This means that the Venterior is ideal for use on a small boat or kayak. One more application for a wired device like this is when you want to cast-off from a dock or pier, or go ice fishing. It's suitable for saltwater and freshwater fishing environments like creeks, lakes, ponds and rivers. To use the sonar sensor, you need to throw it into the water along with its rubber float. Next, you should attach the side-scan adapter to your boat's hull using the tabs provided for mounting. Once the previous steps are complete, you can attach the sensor to a handle before lowering it into the water. When you power on your device, you can adjust things like the sonar sensitivity or turn the battery saving mode on. If you are fishing in conditions of lower visibility, at night or during bright sun, you can adjust the backlight. There's also an option to set the unit of measure, feet or meters. To change the unit of depth, you have to press and hold the Enter key for a duration of five seconds. Unfortunately, once you turn the Venterior off, it will forget the setting you prefer. 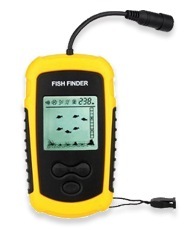 The Venterior portable fish finder comes with a neck strap instead of a mount for the display. That way you can always have it close to you and monitor sonar readings. A separate mount would have been nice, but for the price we can't complain. The transducer on this product comes with a 25-foot cable. For some, it may be too long. For example, when kayak fishing. If that's the case for you, a zip tie can shorten the cable length. The cable isn't a major issue as far as we're concerned, but more options from the manufacturer would be welcome. 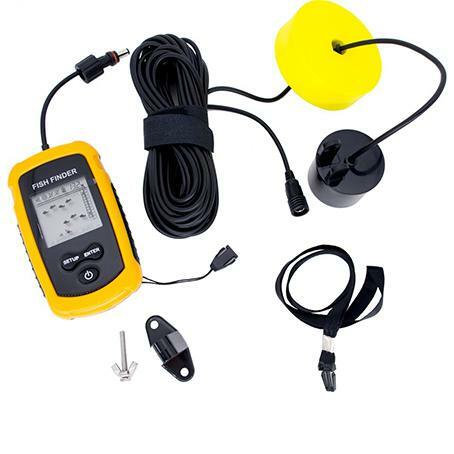 If you want to, you can take this fish finder with you when ice fishing. All you need to do is follow a few steps to make sure it performs well. First of all, you need to remove snow from the surface of the ice to make it smooth. You also need to avoid air between the sonar sensor and ice or water. Finally, making a bigger ice hole will make the Venterior perform better. We didn't have the chance to test it with ice fishing, but other reviewers have not mentioned major problems when ice fishing. With this portable sonar fish finder, you get a few different, but essential features. First of all, it can detect and measure the depth of the water you're using it in. Besides that, it displays readings that match tall and short weeds and different vegetation. It also puts out information about the bottom structure, like sand and rocks. When it comes to depth capability, the Venterior gives out readings from 3 feet to 330 feet. An important thing to know when it comes to depth readings is that this unit measures from the sonar sensor down, not the float. This portable fish finder puts out one beam with an angle of 45 degrees. Better quality units can have two or more beams with wider and narrower angles to cover more water and with greater precision. For the price, we don't have any qualms about this product's single beam design. Despite "Water Resistance Design" being on the packaging, the receiver is not waterproof. You need to avoid total submersion, splashing with water, and cover it in the event of rain. However, the transmitter is waterproof. This device can also show an approximate location of fish targets. It cannot show you how big the fish are. If you want, you can adjust the sensitivity setting within the menu. With the sensitivity set to high, it shows both small and big fish. When you set the sensitivity to low, it will only pick up bigger fish targets. When using the Venterior in cold weather, it might be slower. That why you should avoid temperatures below freezing, if possible. One more thing that impacts performance is turbulence in the water. Things like stronger waves, floating debris, and murky water.